It's clear that Christianity lives or dies by the resurrection of Jesus. A central part of the resurrection account is that Jesus was buried in a tomb which was found empty on Easter morning by some of his women followers. But just how strong is the evidence for this claim? I find huge problems with dismissals such as these for the burial of Jesus. First, we know that the Jews would demand even criminals be buried. The first century historical Josephus tells us as much in his Wars of the Jews: "Nay, they proceeded to that degree of impiety, as to cast away their dead bodies without burial, although the Jews used to take so much care of the burial of men, that they took down those that were condemned and crucified, and buried them before the going down of the sun. "4 Crossan knows of the Josephus passage but dismisses it as something done only "in theory" claiming Jesus's burial is a "maybe, but the barest of maybes. "5 Yet we have the additional testimony of the soldier breaking the legs of the other two condemned with Jesus to hasten their death. This point alone shows that there was a concern the criminals would die so their corpses could be removed before sundown. A second point is there exists archaeological evidence that burying victims of crucifixion is not simply theoretical. In 1968 Jewish archaeologist Vassilios Tzaferis excavated a Jewish ossuary, which is a box that was used to keep the remains of dead. Inside he discovered a well-preserved heel bone with a nail still piercing it from crucifixion. The nail could not be removed because the tip had bent.6 Clearly this with the Josephus passage and the command of Moses in Deuteronomy would make burial a very real possibility. A third point is one that Craig Keener argues by noting of Pilate's wish to accommodate the Jewish leaders in the story. Pilate seems honored their request for execution not because Jesus's actions are offending Roman law, but simply in order to keep the peace. Given Pilate's concern for Jewish sensibilities, their aversion to leaving the dead unburied would've been well understood.7 Add to this that the one requesting the body was Joseph of Arimathea, a member of the Jewish Sanhedrin and I think Crossan's doubts of Jesus receiving a proper burial are on shaky ground. Of course the biggest reason why a majority of New Testament scholars believe that Jesus was buried in a rock-hewn tomb is that we have multiple ancient historical sources that attest to the fact. 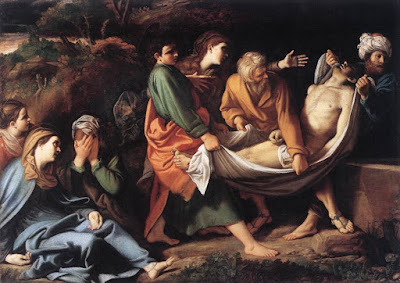 Mark is our earliest gospel and he tells of Joseph of Arimathea asking Pilate for Jesus's body, having his request granted, and laying t in a rack-hewn tomb. We have the testimony from John that corroborates Mark. We also have the early testimony that Paul recited in 1 Corinthians 15:3-5 claiming Jesus was buried. While the account in 1 Corinthians doesn't mention a tomb due to its abbreviated nature, the burial account is clearly very early and part of the fabric of the resurrection story. So, when comparing the evidence for Jesus's burial, we have very early accounts of his burial showing up in multiple independent sources. What is the evidence for Jesus being left on the cross or eaten by dogs? There is none. There isn't one single document that infers such a fate. Even the Jewish leadership didn't say "The dogs must've eaten the body" when the disciples shortly afterwards proclaimed his resurrection. Instead, they claimed the disciples stole the body, which implies that the body was missing from an identifiable location, e.g. a tomb. Given the evidence, it is much more reasonable to believe that Jesus was buried in a tomb than to believe otherwise. All the evidence we have points in only one direction. To doubt the burial of Jesus, like Crossan and Guignebert have is to read into the account additional details that are not evidence but conjecture. Conjecturing a theory that opposes the facts isn't good history, it's a sign of bias. 1. Guignebert, Charles. Jesus. New York: U, 1956. Print. 500. As cited in Josh McDowell's Evidence That Demands a Verdict, Volume 1: Historical Evidences for the Christian Faith. San Bernardino, Ca. : Here's Life, 1979. Print. 2. Crossan, John Dominic. Who Killed Jesus? : Exposing the Roots of Anti-semitism in the Gospel Story of the Death of Jesus. San Francisco: HarperSanFrancisco, 1995. Print. 187. 4. Josephus, Flavius, and William Whiston. The Works of Josephus: Complete and Unabridged. Peabody, MA: Hendrickson, 1987. Print.679. 6. Biblical Archaeology Society Staff. "A Tomb in Jerusalem Reveals the History of Crucifixion and Roman Crucifixion Methods." Biblical Archaeology Society. Biblical Archaeology Society, 22 July 2011. Web. 30 Oct. 2015. http://www.biblicalarchaeology.org/daily/biblical-topics/crucifixion/a-tomb-in-jerusalem-reveals-the-history-of-crucifixion-and-roman-crucifixion-methods/. 7. Keener, Craig S. The Historical Jesus of the Gospels. Grand Rapids, MI: William B. Eerdmans Pub., 2009. Print. 326.